Have you have wanted to visit a location that always seemed to have a way of escaping you – regardless of how big it was or how close you got to it? For me, that location was Niagara Falls. Over the years, I cannot tell you how many times I have worked in Buffalo, NY. Every time I have gone, I went with the full intention of finding time to visit Niagara only to fail miserably. Heck, one of the many times I attempted to go was with a co-worker at two in the morning… only to learn it was closed. How in the world does one close a waterfall? At that point I was pretty sure the waterfall gods were against me. After learning about all my crazy and less than successful attempts at visiting Niagara Falls, Holiday Inn reached out in hopes of helping me check this stubborn stop off my bucket list. Having visited Buffalo many times, we decided it was time I try my luck somewhere new. 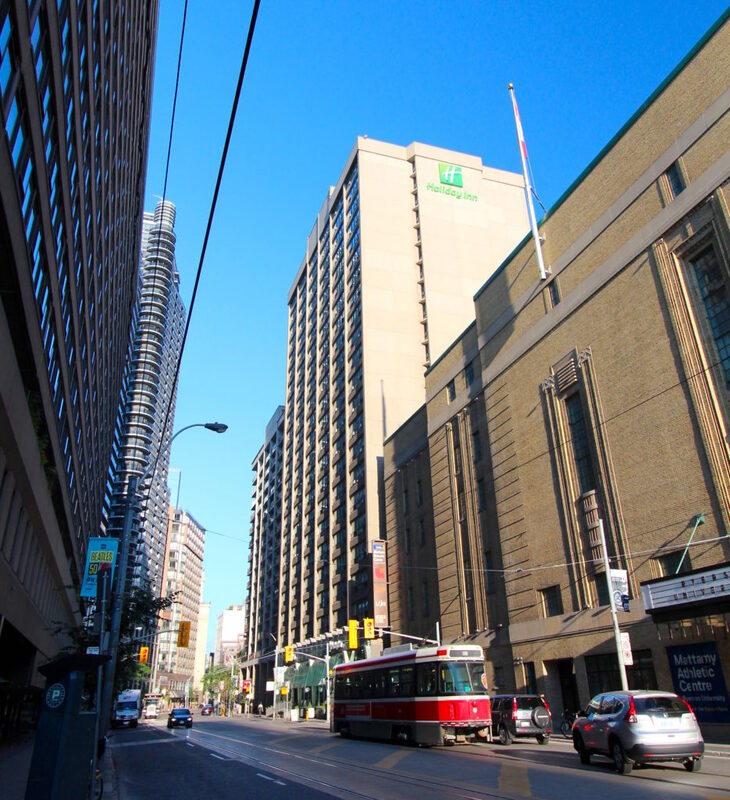 For this trip, I would stay at Holiday Inn Toronto Downtown Centre. I was pretty excited since, I had never been to Toronto and I had always heard the Canadian side had the best view of Niagara Falls! Arriving at Niagara Falls, I was a little confused. For some reason, I always expected it to be kind of remote. Instead of venturing off into the wilderness, Niagara Falls was actually lined by a bustling boardwalk followed by Niagara River Parkway. …Not at all what I envisioned. Walking along the boardwalk, the size of the falls still hadn’t smacked me like I expected it to. Don’t get me wrong – Niagara is huge but I found standing nearly level with the top of the falls made it hard to gauge it’s height. Mist poured out of the falls as the water rushed over the rocks and splashed into the river below. I watched as it formed a giant cloud that rose at least a couple hundred feet (above the highest point of the falls) into the sky. Walking along the boardwalk, the mist began to fall on sightseers like light rain. Those who came prepared (armed with raincoats, ponchos and umbrellas) leisurely walked the stretch unfazed… I on the other hand, half laughed and half cursed while scrambling to cover my camera equipment. Once my electronics were safe, I have to admit it was pretty funny watching other first timers as they squealed, laughed and ran for cover. 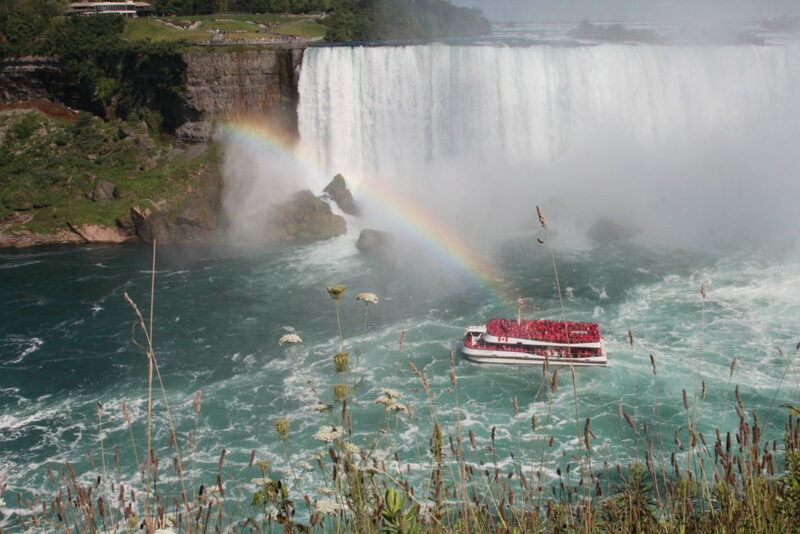 Another unexpected surprise was Niagara’s endless supply of rainbows. They popped up randomly from several different locations, moving and changing with the sunlight. Some sat at the bottom of the falls, waving and bubbling in the mist. 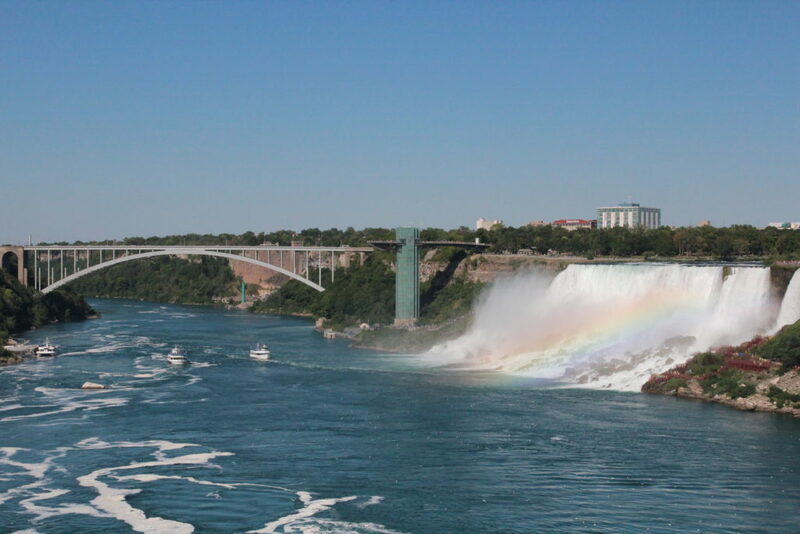 There were also half and full arches, some burst from Niagara River while others stretched across the falls like bridges between the U.S.A and Canada. Looking down into the falls, I watched as the Maid of the Mist made several trips out to the falls packed full of poncho-clad people. At times the mist was so thick, the boat became difficult to spot. As the Maid bobbed around in the mist, some movement just to the right of the falls had caught my eye. 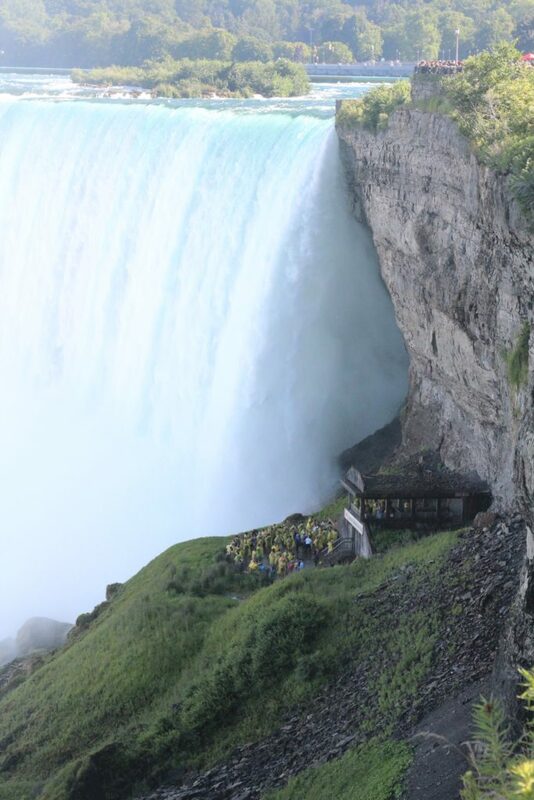 At the base of the cliff, that supported the boardwalk I was standing on, was the platform for Journey Behind the Falls. I had to get down there. The entrance to Journey Behind the Falls was located inside Table Rock Welcome Centre – right next to Horseshoe Falls (the Canadian section of falls shaped like a horseshoe). After buying a ticket, I was given a yellow poncho and directed into an elevator that brought me 150 ft. down into the underbelly of the falls. 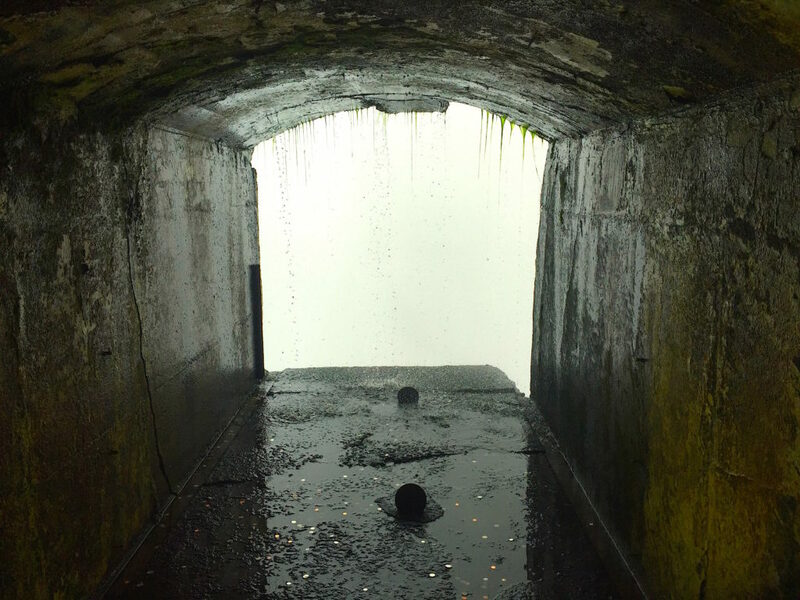 When the elevator doors opened, I found myself staring into a tunnel system that split in two directions – one that led visitors 1/3 of the way behind the falls’ wall of water to two portals and another that lead to the main platform, which included an upper and lower observation deck. Walking through the damp, dimly lit tunnels, I made my way to the Cataract and Great Falls portals. The portals were just sections of the tunnel that ended abruptly where the back of the falls began. I was surprised there were only hip level fences keeping people about ten feet away from the openings. The water violently crashed, splashed and swirled in front of the portals. There was no seeing through the falls – it was a thick, bright white, wall of water. Besides the debris, concrete and rushing water – wishes littered the ground in the form of coins. The tunnel to the upper and lower observation deck was buzzing with both young and old. 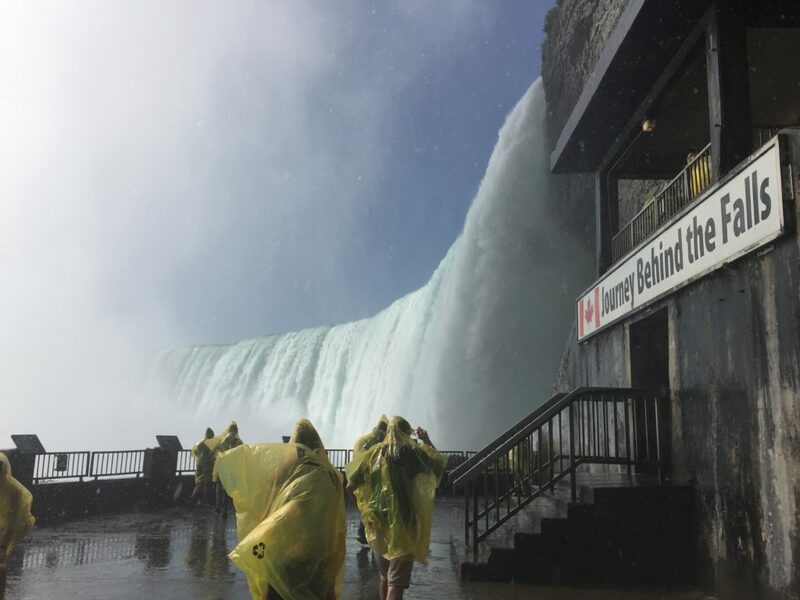 Some were soaked having just come from the viewing platform (lower observation deck), while others prepared for what was sure to be a wet experience. The upper observation deck was sheltered with a roof but it had large open windows on all three sides. Wind whipped through the windows while water dripped in creating puddles on the cement floor. It was my last chance to cover anything that wouldn’t survive getting wet on the lower observation deck. 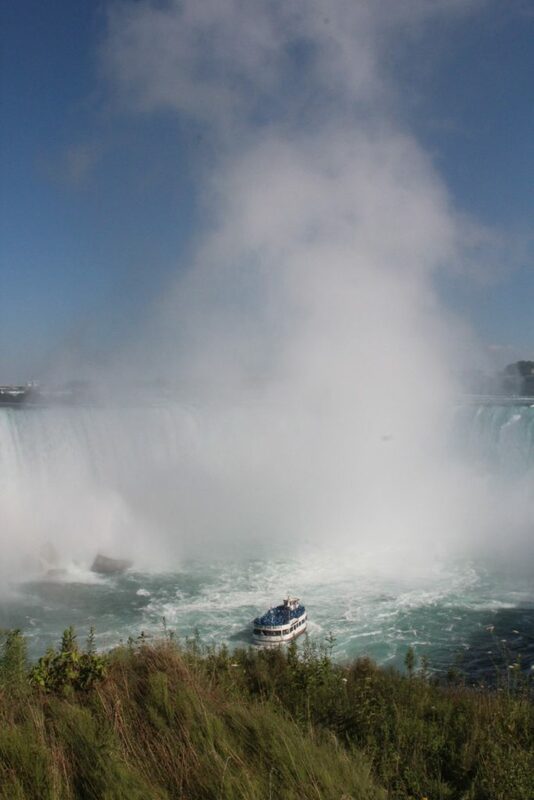 Standing at the foot of the falls, Niagara towered over me. I watched and listened as water came crashing down, letting out a thunderous roar. The mist fell like big, thick, raindrops making it difficult to see. I watched as adults ran around like children, yelling with excitement while taking in the sights and I laughed as strong winds inflated our ponchos leaving us all looking like the Stay Puft Marshmallow Man. From the boardwalk, the people on this platform looked like ants to me… from the platform – I felt like one! 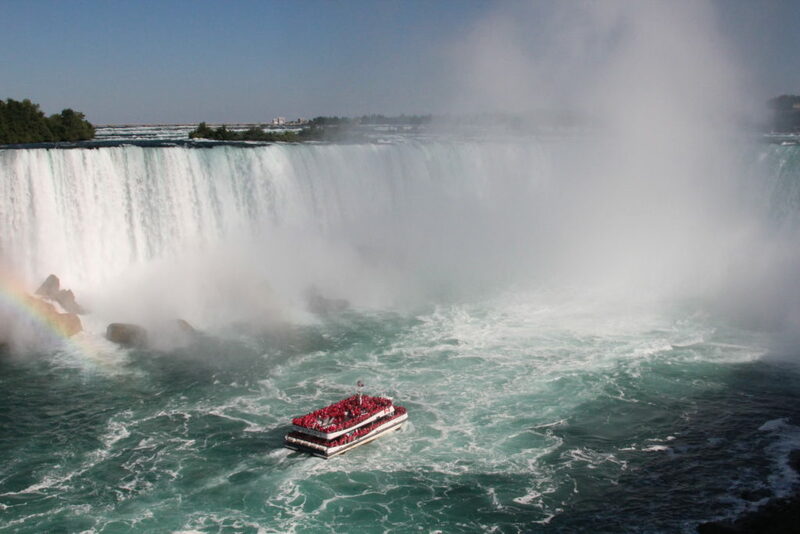 Niagara had finally “smacked” me… the overwhelming power of the falls left me wide eyed and at times breathless, due to the enormity of it all. 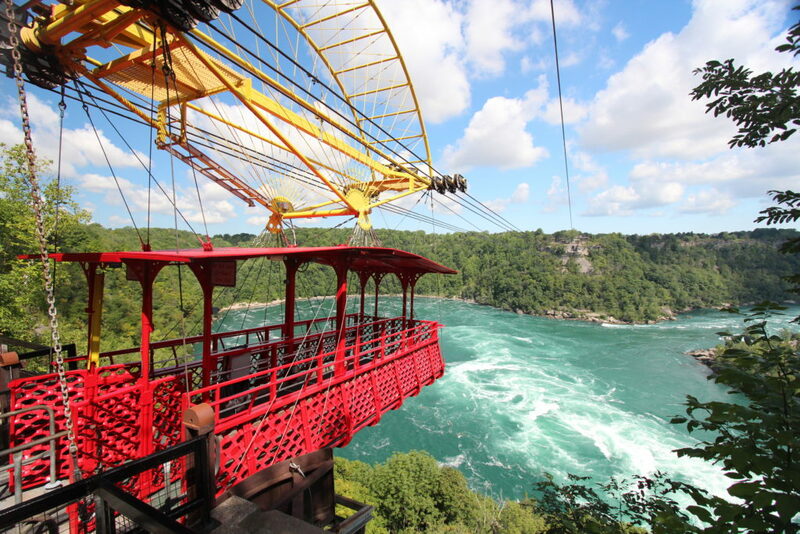 Celebrating its 100th year, the Whirlpool Aero Car was an experience that is hard to forget. 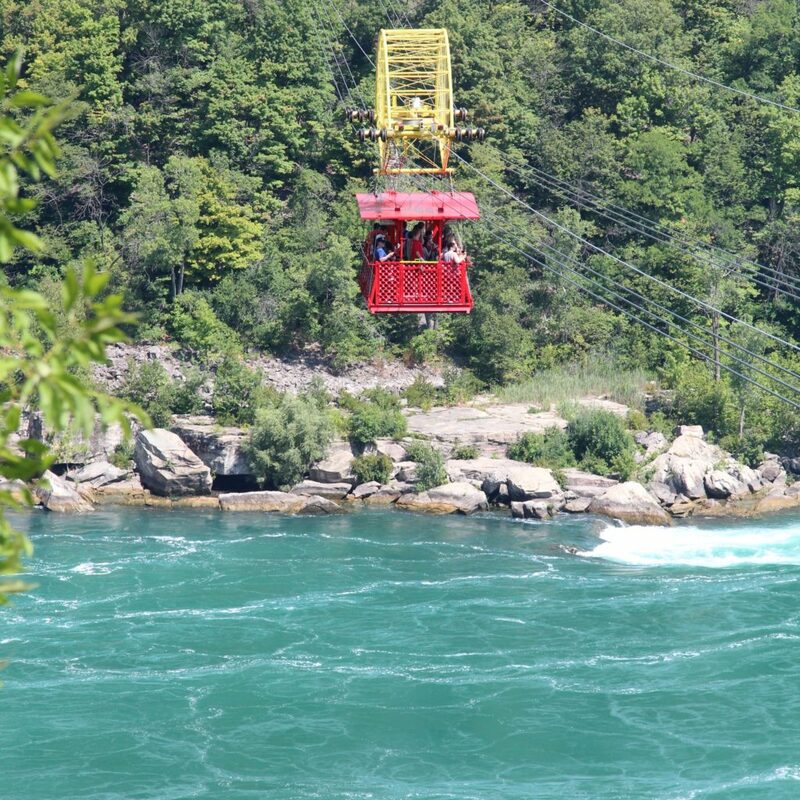 Suspended from six cables, the antique cable car takes visitors on a round trip aerial tour of the Great Gorge, high above the raging Niagara Whirlpool. As we were loaded onto the car that was standing room only, the operators joked that everything was 100 years old – including the cables. Talk about a lot of nervous laughter. Once the car reached its carrying capacity of 35 passengers, the gate closed behind us as an alarm sounded – letting us know the adventure was about to begin. With that, the cable car lurched forward off the loading platform, which lead to a lot of gasps and laughs. With the exception of that initial bump off the platform, the cable car smoothly glided out over the whirlpool. 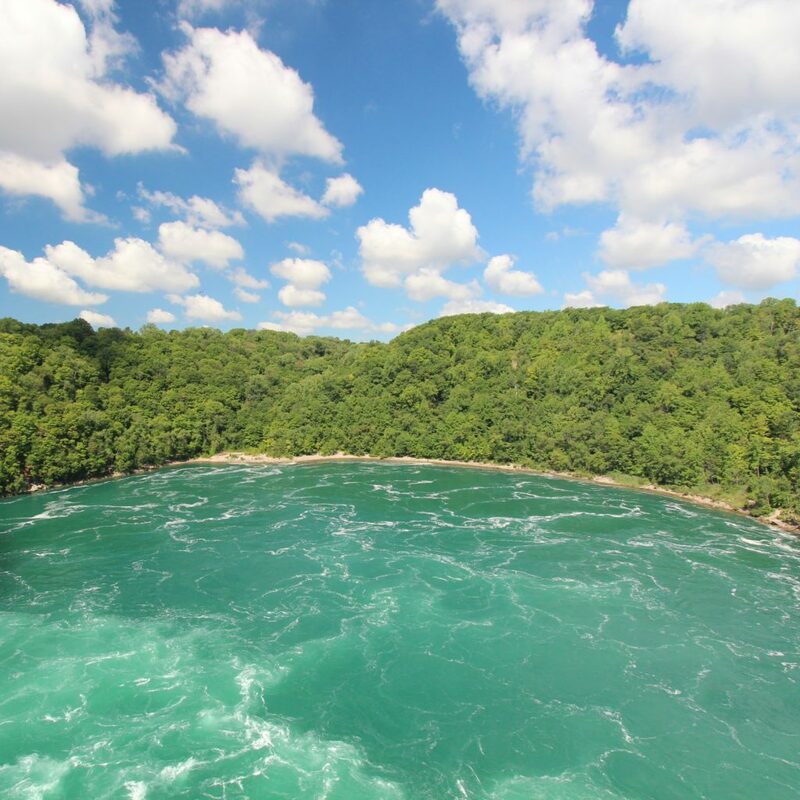 As the river rushed down from Niagara Falls, I watched the clear, turquoise water get caught in the gorge, swirling below us in a counter clockwise direction. Between the water and the dense vegetation that covered the land around us, I would have thought I was in Puerto Rico – not dangling between the Canadian and United States boarder! Reaching the end of the line, everyone switched positions so they could ride back with a different view while the car came to just enough of a stop to enable it to change direction. Given the fact the car hung from cables, high above a whirlpool – I honestly expected to be a nervous wreck. Surprisingly, I was the exact opposite. Besides the bump off and back onto the loading platform – the whole ride was pretty smooth. Add the beautiful view and the fact I was busy taking photos and video, the ride was over before I had a chance to be nervous! Sometimes the biggest challenge with traveling – especially to places you’ve dreamt of getting to for years – is getting past the expectations you’ve built up around the location and not letting the reality ruin your experience. Once I allowed myself let go of the remote image I built up and mentally navigated myself around the crowds and overly commercialized attractions, Niagara actually exceeded my expectations. Niagara Falls took me out of my comfort zone, reminding me just how small I am and how powerful, beautiful and amazing the world around us is. After years of missed opportunities and failed attempts, I had finally made it to Niagara Falls. Luckily for me, it was worth the wait! HUGE thank you to Holiday Inn for helping me get to Niagara! Amazing experience and as always – a fantastic stay! 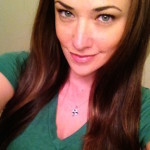 Thanks for write up Kris! It’s as close as been there.